They need the grace — that is the strength that comes from God and the illumination of their minds by God. Only then will they know how to properly Consecrate Russia together as commanded by God through the Message of Fatima. Only then will they be able to obey this command. This grace will only be given to the Bishops if enough people do what Our Lady of Fatima asks. That is, only if enough people like you obey Our Lady’s commands. We today are now living through the most terrible battle in which the enemies of the Church fiercely attack Her. This battle was foreseen by St. John Bosco in 1862. The picture above depicts the famous prophetic dream of St. John Bosco and shows the enemies attacking the Church and the Papacy with all kinds of false propaganda as well as with military might. They also attack with various weapons in hand-to-hand combat. The Pope falls seriously wounded, but is helped up instantly, miraculously. 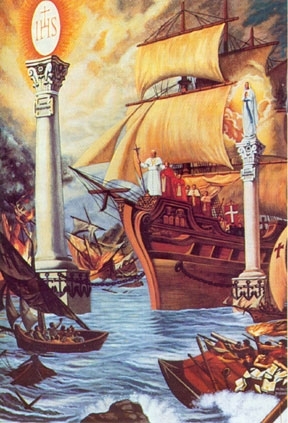 The Pope responds to all these attacks by steering the Church (represented by the ship) towards True Devotion to Jesus in the Eucharist and to the Blessed Virgin Mary (represented by the two columns). He strains every muscle to steer this course despite all attacks of the enemy. A second time the Pope is mortally wounded and dies. His successor is immediately elected, to the consternation of the Church’s enemies. The new Pope successfully steers the Church towards these two Devotions and the enemies panic, disperse and destroy each other. A great peace now prevails.